Get the world's most complete ballistics calculator - a rugged Kestrel 5 Series Weather Meter with the science of accuracy built in! The Kestrel 5700 Elite Weather Meter features the full power of the Applied Ballistics Elite ballistics solver along with the Litz custom drag models for over 400 bullets. Together with the Kestrel's accurate measurement of wind and air density this power combination delivers elevation and windage solutions for unprecedented accuracy on extended long range shots. Easy Mode (Ballistics Meters with LiNK only). Easy Mode is a simplified version of Ballistics mode with additional guidance for users new to using the Kestrel. Easily store up to 30 custom gun profiles, up from 16, that include an exhaustive list of rifles, loads and accessories to choose from. Trace Spotting View the new Trace value directly on Range Card for a more precise measurement option. The Trace calculation will display the Mils/MOA above your point of aim where the bullet will reach its peak and thus Trace will be most visible. Optional Privacy Setting With the addition of a Privacy PIN code in the Bluetooth menu, unauthorized and accidental connections can be prevented. Plus, protect saved data and enjoy increased security by using this Privacy setting in the Kestrel Ballistics LiNK app. Custom Drag Model Memory Keep Custom Drag Models saved in profile memory with the ability to seamlessly scroll to G1 or G7 models and back to custom without losing data. Expanded Bullet Library Access new and updated information in the Applied Ballistics bullet library via the Kestrel LiNK Ballistics app for an extensive catalogue of bullet data. Saved User Name After a firmware update, your Kestrel will now retain the user-generated nickname given to it, making it easier to find in Bluetooth search lists. Shortcut between Weather & Ballistics Mode Quickly switch between Weather and Ballistics mode with a simple double-tap action. With this update youll now return to the same ballistics screen you were on before switching to weather mode. What are custom drag profiles and why are they better than G1 & G7 BC's? Applied Ballistics has been providing custom drag models for use in trajectory prediction for the past several years. Custom Drag Models (CDMs) for bullets are a more refined way of modeling drag for bullets because youre not referencing a standard like G1 or G7, rather youre using the actual measured drag of a specific bullet in a ballistic solver. This results in more accurate trajectory predictions especially thru transonic. Historically, one of the biggest challenges of calculating accurate trajectories was properly modeling the aerodynamic drag of bullets. Applied Ballistics ongoing live fire research in this area has elevated the state of the art by reducing the uncertainty in this area. In summary, the measured CDMs provided by Applied Ballistics have increased the accuracy of ballistic solvers. These CDMs are available for all 500+ bullets in the AB library, and run on the various platforms and devices which run the AB program. This is the state of the art, in your hands. Kestrel Elite LiNK enabled units can wirelessly communicate with mobile devices, computers and integrate with LiNK compatible laser range finders for improved speed and accuracy. 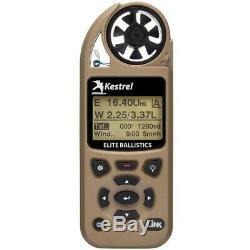 The item "Kestrel 5700 Elite Meter w Applied Ballistics & Bluetooth LiNK Desert Tan" is in sale since Sunday, November 15, 2015. 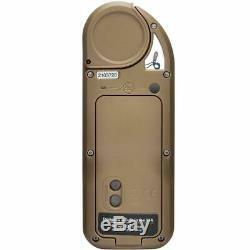 This item is in the category "Home & Garden\Yard, Garden & Outdoor Living\Garden Décor\Weather Stations". 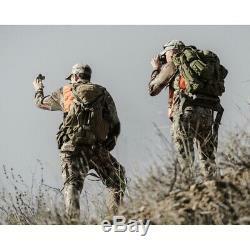 The seller is "weatherrepublicllc" and is located in Coatesville, Pennsylvania. This item can be shipped worldwide.